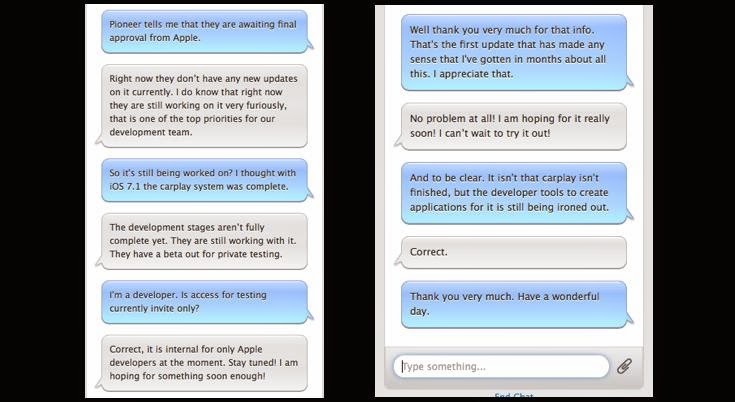 The gray bubble is the Apple customer service person. Seems like Apple will release CarPlay with iOS 8 which will probably be available next month when the new iPhones are announced. Although there isn't a definite ETA it looks like there is a lot of waiting to do. The firmware update for Pioneer's NEX receivers will be delayed too. 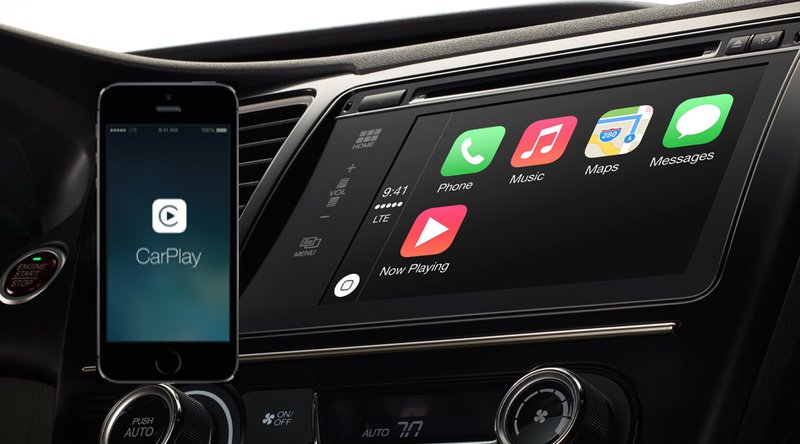 If Apple doesn't feel CarPlay is quite ready for primetime yet, Pioneer will have to hold on too. So, what is Pioneer going to do to make it up to their customers after promising an "early summer" release of the firmware (which it still says on the Pioneer CarPlay page, by the way)? Sounds like classic bait-and-switch to get people to buy NEX receivers. I doubt they do anything, nor would I expect them to. This is an Apple issue. Same as it was when Apple moved to the lightning cable. Pioneer is simply caught in the middle. Pioneer might be caught in the middle with the update, but that's no excuse for them STILL to be touting the release as "early summer" on their CarPlay webpage. Shouldn't they have changed that by now? It's pretty obvious that Pioneer wants to sell a lot of NEX receivers based on the CarPlay feature without admitting that they have no idea when they'll be able to get it into consumers' hands--just like Avicsync. At this point, a little goodwill to their customers might be a good idea. Finally we have an update. Sad to hear about a delay but at least we're informed! I've been checking the Pioneer website daily checking for firmware update or any info. I'm not sure if I've been deceived by Apple, Pioneer, or both, but Pioneer has been touting the "Early Summer Release" (now "Summer Release") since at least May, maybe even earlier. Very frustrating and disappointing.